Many healthy chocolate chip cookies aren't really as healthy as they seem. They may have less fat, but they often have more sugar. This chocolate chip cookie recipe is different. It is full of heart-healthy oats, bran flakes, and nuts. 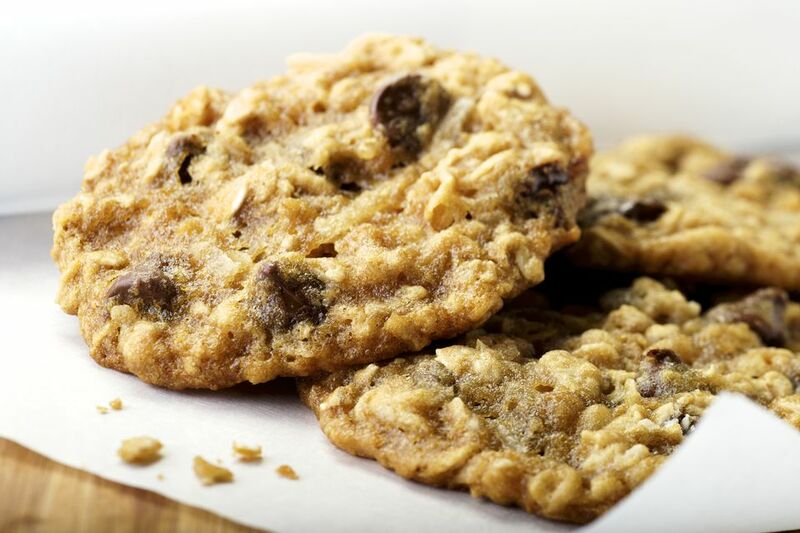 It has just the right amount of texture and crunch combined with a soft cookie base. Line a cookie sheet with parchment paper or a Silpat mat. Or spray with nonstick cooking spray. Stir together the flour, baking soda, and baking powder in a medium bowl. Set aside. In a large bowl, beat the butter until creamy with an electric mixer. Beat in the sugars. Beat in the egg and vanilla extract. Add the flour mixture until well combined. Stir in the oats, bran flakes, chocolate chips, and walnuts. Drop by the teaspoonful onto prepared cookie sheet approximately 1 inch apart. Bake 12 to 14 minutes. Cool on wire racks. Serve warm or store in a tightly covered container for up to three days. According to Wikipedia, and Nestle Toll House, the chocolate chip cookie was invented by Ruth Graves Wakefield. She owned the Toll House Inn, in Whitman, Massachusetts, a very popular restaurant that featured home cooking in the 1930s. Her cookbook, Toll House Tried and True Recipes, was first published in 1936 by M. Barrows & Company in New York. The 1938 edition of the cookbook was the first to include the recipe "Toll House Chocolate Crunch Cookie" which rapidly became a favorite cookie in many American homes. There are different versions of how the cookie came to be: The most popular and established story is that Ruth Wakefield stated that she deliberately invented the cookie. She said, "We had been serving a thin butterscotch nut cookie with ice cream. Everybody seemed to love it, but I was trying to give them something different. So I came up with Toll House cookie." A different version of events says that Wakefield is said to have been making chocolate cookies and on running out of regular baking chocolate, substituted broken pieces of semi-sweet chocolate from Nestlé thinking that they would melt and mix into the batter. They remained separate and distinct, and the chocolate chip cookie was born.